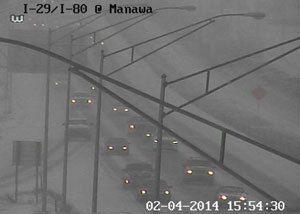 DOT traffic camera view in Council Bluffs. The snow continues to fall across the state and it is expected last through the night. Bob Younie with the Iowa DOT says the plows are working as fast as they can but most of the roads south of Highway 30 are not clear. “Quite a few of the roads in central and southern part of the state have snow on them — so its winter driving conditions. It’s drivable, but we all need to give ourselves just a little more time to get to where we are going. And not drive like its June, it February,” Younie says. Younie says the plows have been out since the first flurry early this morning. With snow still falling it will be well into Wednesday before roads are clear. Find out the latest road conditions at: www.511ia.org.